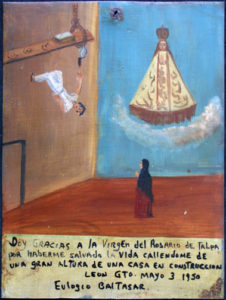 The Latin term “Ex voto”, short for “ex voto suscepto” means “from the vow made.” The vow was made to a saint who assisted in what was considered an answered prayer, a miracle that happened, after the fact, by the one who made the vow. 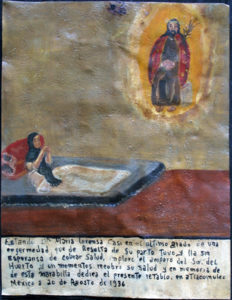 Thus as a traditional custom in early Latin American Catholic Churches, a small commemoration was created of the moment of personal humility when an individual asks a saint for help and is delivered from disaster and likely from death. Then this object is gifted to the Church to be on display as a public offering of thanks as well as a reminder to others of prayers answered.The votive custom of offering gifts to the Divine in thanksgiving for a miracle received, dates back to ancient Mesopotamia and Egypt. 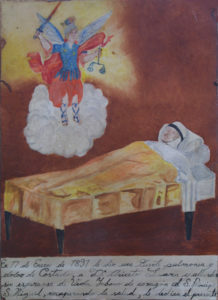 Such gifts were hung on the walls of Roman temples. 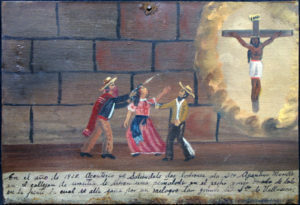 Eventually incorporated into the Christian religion, the custom became a touching expression of faith in the Divine that spread to Mexico during Colonial days. 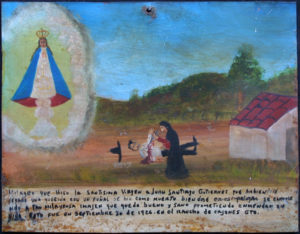 There were also Ex Voto objects of various metals, specifically called milagros in very early days with more private meanings. 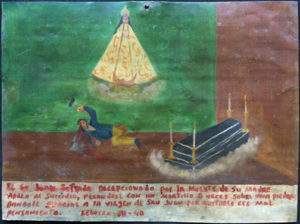 In Countries where silver was in abundance, silver objects, were commissioned as offerings to the Saint and gifted to the church. 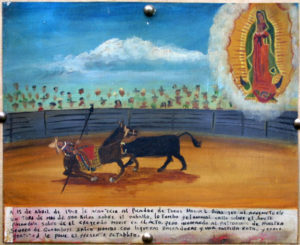 In rural areas of Mexico the commissioned paintings were small and were most often created with oil paint on zinc roofing tin. 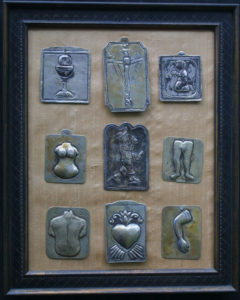 Each Ex Voto depicted the event as well as the saint to whom the vow was made and who assisted in granting the miracle. 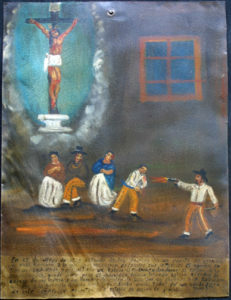 The untrained artists often took creative approaches using bright colors along with Roman Catholic church tradition to produce the identifiable holy figures. At the bottom of each Ex Voto was a brief inscription in the best Spanish known by the artist. 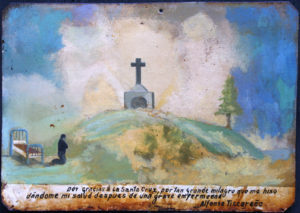 The individualized inscription accounting for the specific miracle was most often misspelled and grammatically incorrect. 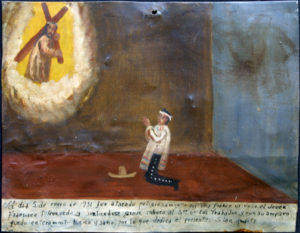 During the late 1800s and early 1900s many small paintings came to line the walls of Mexican churches as gestures of thanksgiving, replacing powerful doctrine-driven images of the Church saints with personal and direct answered pleas for help. 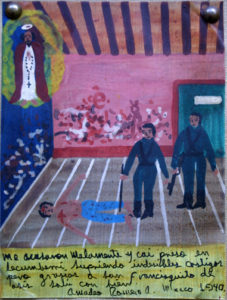 The votive paintings are intimate records of the dramas of everyday life, bulls fights, lightning strikes, accidents, ill health and false imprisonments in which Divine intervention was believed to have led to survival and reprieve. 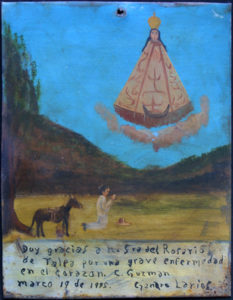 Ex Votos began finding their way into private collections many years ago. Diego Rivera and Frida Kahlo popularized them by avidly collecting them.